Wholesale Sports wasn’t actually a wholesaler, and it didn’t sell traditional sporting equipment. But their ambiguous name wasn’t their only hurdle. Their brand needed to stand for something more to those who religiously pursue their passion for the outdoors, especially hunting, camping and fishing. The client already had all the ingredients required to create a cult-status brand, when they called upon Cult to give them a framework, and a more relevant personality. After diagnosing the effects of the client’s current marketing behaviour, and initiating custom research to uncover actionable insights into both their audience and their competitors, we prescribed a 24-month strategy aimed at achieving greater marketing results through enhanced customer engagement. We built a more compelling brand value proposition aimed at improving the client’s relevance and unique proposition, and implemented a new creative brand platform. We also optimized their media mix and key messaging, to allow them to better articulate their “why”, instead of just their “what”. 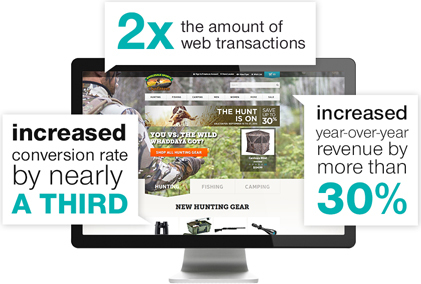 We consciously went the opposite direction than the competition, who focus more on their in-store experience and less on enabling devoted outdoorsmen to get the gear they need to get back out where they belong. Within the six months of embracing and implementing Cult’s brand strategies and improved go-to-market strategies, the client enjoyed their best performing summer selling season ever. By resonating with the die hards, and sharing their joy of the outdoors, the first quarter the client adopted our ethos proved to be the best in its history. Amazed by that success, the client implemented the remainder of our marketing plans, and continues to utilize us for help with other cult-brand best practices, such as improving employee engagement; deploying our proven online user experience strategies to improve eCommerce conversion, and creating new-content marketing strategies—like a quarterly Gear Guide, and a brand ambassador called Owen the Wild, All aimed at attracting their most profitable customer segments.